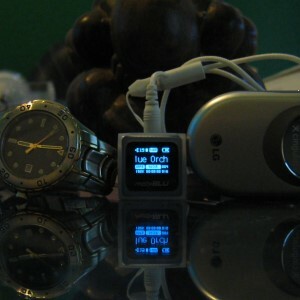 MobiBLU DAH-1500i Cube MP3 Player: Smallest formfactor mp3 player available! Amazon now carries the 2GB mobiblu cube as well, worth buying if you don't update your songs every day from your computer. The unit comes with a USB-to-headphone-jack adapter needed for both battery charging and file transfer, so don't just toss it in the Shoebox of Entanglement with other generic cords. The provided necklace/ headset is of remarkable quality, though the white and silver decor (standard despite the color of the unit you order) is a bit overstated. No matter, the unit plays fine with any headset, including the headset-as-FM antenna feature. Finally there's the manual, a 'cube crate' ostensibly to protect the player if you drop it, and a mini CD. 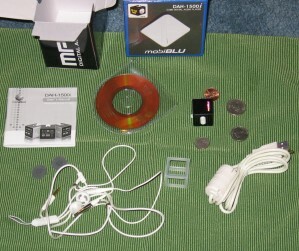 The CD has a firmware update on it, but there's a more recent one available online at the MobiBLU America website. 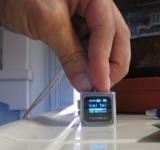 MobiBLU ® claims that the DAH-1500i is the world's smallest flash mp3 player, and I've been unable to find anything to dispute that. Prior to purchasing it, I looked at the few photos I could find and tried to envision the 24mm size with a small ruler. With the thing in hand, all I can say that it's really, really tiny. Maybe the coins in the image will help to illustrate. It's way smaller than my cellphone, which lives comfortably in my pocket for most hours of the day. It's excellent. The SRS WOW surround sound feature is great, I never had that in a portable before. The volume is displayed on the front of the OLED screen. It goes up to 30, but it becomes painful just above 25. My last two flash mp3 players got nowhere near this loud. I appreciate the option to court deafness should I desire it. The display is bright and clear, but it does hurt battery life if you set it to 'always on'. My photos don't do it justice... in the second shot you can see it's still visible even with a strong light in the background. The song title scrolls pretty fast because I set it that way prior to taking the photo, so it looks a bit blurred. With such a small screen, a faster scroll speed is required. Some messageboards have comments about the controls being difficult to use. The buttons are fairly straight forward, but admittedly small. Each surface of the cube is 24 X 24mm, so there's really not a lot of space to mount hand controls. Still, I'm able to orient and manipulate the controls blindly (in a pocket) after only a few minutes with the player. The US version of the machine (the one with the i at the end, DAH-1500i) plays both MP3 and WMA formats. If you want it to work with iTunes, you're out of luck, but you probably knew that once you explored the limitations of your last iPod, right? There's a load of WMA based music vendors out there if you're still the type who only wants a couple of songs from an album. Indeed, a lot of artists will not sign on with certain online music outlets, but at least WMA DRM sites provide alternatives and competition vs the one-size-fits-all iTunes store. The CUBE 2 handles licensing the same way. 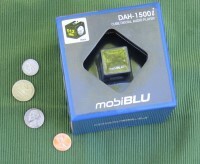 Actually, regarding the US vs Other versions of the DAH-1500, MobiBLU has this to say: There are currently two versions of the Cube Player being sold in the world today: The DAH-1500 and the DAH-1500i. The DAH-1500 is being sold outside of the US market under the brand name JNC with the model numbers SFF-8100, SFF-8005, and SFF-8002.The JNC Version are not THE AUTHORIZED PRODUCT FOR THE US MARKET. The DAH-1500i is the only version authorized for the US market and it adds two very important features: USB 2.0 and WMA DRM (Digital Rights Management). The USB 2.0 provides much faster file transfer speeds and WMA DRM means that the device is compatible with major music download sites (pay per song). ...so approach ebay sellers with caution, you'll likely get a substandard non- i unit. 0.94" x 0.94" x 0.94"
Self Emitting Blue OLED (Organic Light Emitting Diode) Display combined with Blue letters brings new beauty to the unit. OLED provides superior sharpness, and a bright, easy to read display. Now you can download and play purchased music from several popular music download sites. Enjoy FM radio listening as well as digital music files (MP3/WMA). It can also record your FM Programming which allows you to listen to it over and over or to save it on your PC. By connecting the product to PC, the Windows system automatically recognizes it as a removable disk. No additional software needed to load your music files over the blazingly fast USB 2.0 connection. It can also be used as storage for other types of files. Built in high quality microphone allows you to record your voice. Features 5 preset equalization modes; Normal / Rock / Jazz / Pop / Classic / and you can also customize equalization to suit your sound. 3D Surround and superior Bass enhances your music listening experience. The player can play MP3 files saved in multiple folders. Those files and folders can be selected and played as if in a Windows environment. The built in clock keeps you on time. No extra battery or external charger is required. This advanced battery system is easily recharged by connecting into the USB port on your PC. Previous user settings and track location are automatically restored when the unit is powered ON in case of sudden power down. Mobi blu firmware is easily upgradeable to new features and functions. ThoroughReview.com is an aggregate of forward-thinking consumers.